We are sad to say that Lou passed away on March 25, 2004 at the age of 25. He had a long, happy life, and we were very sad to see him go. It has been hard, but it is best. He is now enjoying Heaven’s pastures, and taking care of his little buddy Leo. 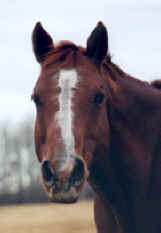 Here is Lou in the fall of 2002, after the sun as made him a nice deep red chestnut. Lou was my first horse, and has taught me alot in these many years. 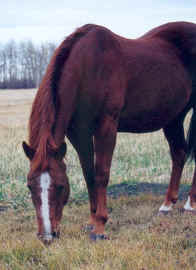 He stood 15.2hh (at the withers) and even though his body was aging, his heart was just as young as a 2 year old stud. Lou was an old rope horse that I tried to turn into a barrel horse. It is because of him that I have such a strong passion for horses. He taught me everything I know.